Striped Dolphins are aquatic mammals. 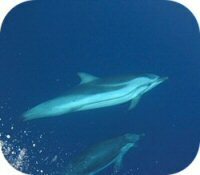 Size: Striped Dolphins are approximately 8-9 feet long and can weigh up to 330-350 lbs. The male Striped Dolphin is slightly longer and heavier than it's female counterpart. Habitat: Striped Dolphins are abundantly found and prefer highly productive tropical to warm temperate waters that are oceanic and deep. Diet: Striped Dolphins are predators and eat cephalopods, crustaceans, and bony fishes. The Striped Dolphin, can vary by region and be influenced by available food sources. Senses: Striped Dolphins have an acute sense of hearing. They have acute vision both in and out of the water. Their sense of touch is well developed. 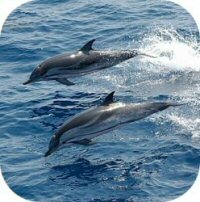 Description: The Striped Dolphin has a slender body with a long dark beak. They are boldly patterned in bluish grey and white. Striped Dolphins have a lateral stripe and spinal blaze, that are characteristic of the species. These markings can vary significantly from dolphin to dolphin. Communication: Striped Dolphins communicate using a series of sounds and whistles. The Striped Dolphin was discovered by Franz Julius Ferdinand Meyen, a German physician and botanist, in 1833. Hunting: Striped Dolphins will often hunt in with their pod. Gestation: Striped Dolphins carry their young for 12-13 months. Striped Dolphins will give birth every 3-4 years. Birth: Striped Dolphin calves are born tail first. Calves are up to 3 feet in length, and weigh 22 lbs. Calves: Striped Dolphin calves will nurse for up to 12 months. Sexual Maturity: Striped Dolphins become sexually mature at about 7 ft in length. Females are typically mature between the ages of 5-13 years, while males mature at 7-15 years of age. Life Span: Striped Dolphins can live up to 58 years. Striped Dolphins, like many other dolphin species have been known to become trapped in fishing nets. They have been hunted by humans in Japan, the Caribbean and Sri Lanka. They are also subject to pollution and environmental toxins and contaminants have been known to lower their disease immunity. Social Structure: Striped Dolphins are friendly and they live in large pods. The size of the pod can vary. Pods can be between a few Striped Dolphins to over 1,000 with average school sizes ranging from 25-100 dolphins. Rarely do Striped Dolphins associate with another species of whales, or dolphins. Attempts to keep the Striped Dolphins in captivity, but their refusal to eat while in captivity has caused all the captured Striped Dolphins to die within two weeks of being captured. Athleticism: Striped Dolphins are very agile and athletic. They are are known to playfully jump more than 20 feet out of the water. Striped Dolphins have also been witnessed bow-riding, and roto-tailing, a behavior where they make high arching jumps then rapidly rotate the tail, before re-entering the water. They can also dive to depths of 200 meters.